Harvesting: If your garden contains fruiting crops like tomatoes, zucchini, and beans, they should be bearing delicious fruit and vegetables now! Staying on top of a harvesting routine will encourage the plants to produce. Pests love food so harvesting frequently will also keep them at bay. Containers: Your containers have made good homes for your plants all season. Don’t forget to clean them when necessary so that plants remain healthy. Any white crust that develops on your containers is just salt buildup. Take a minute to flush them out with water whenever you see buildup. Houseplants: Make sure that your beautiful houseplants thrive throughout the summer by determining the best location for them now that the sun is out in full effect. Windows can magnify summer sun so make sure your houseplants aren’t sitting in direct light. Filtered light or shade for your plants will prevent scorching. Annuals: Make room for new plants by removing annuals that have finished blooming. 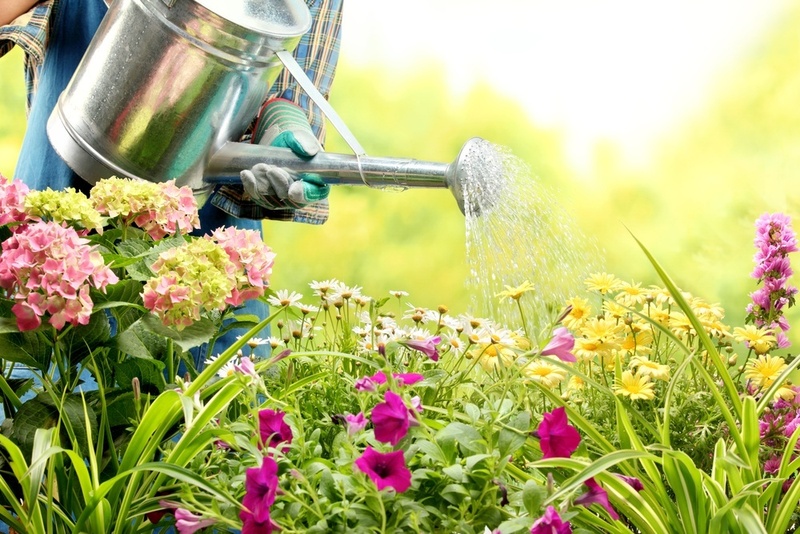 Watering: In the midst of hot weather, make sure your watering routine is as effective as possible. Watering early in the day and late in the evening makes up for evaporation that takes place outdoors in the middle of the day. You know that your plant is quenched when the top 8”-12” of soil is saturated with water. If liquid starts leaking from the soil, you know that you can stop watering. Container plants: Container plants need more water than plants in the ground do. As they get larger and the weather gets hotter and windier, container plants may require daily watering. Hanging baskets need the most water of them all. Make sure you use water soluble fertilizer so that the nutrients stay in the soil instead of running out of the holes in your containers. Trees and shrubs: Have you acquired any new trees or shrubs lately? Keep them healthy by giving them extra water, amounting to 2 soakings weekly. Equipment like buckets, traditional hoses, soaker hoses, and sprinklers can be useful in watering tree and shrub canopies. Sprinkler system: Sprinkler systems are a great way to address your garden’s needs during the hottest months of the year. There are a couple of adjustments you can make to get the most out of sprinklers. Position them so that no water is wasted on paved surfaces. Your lawn should be getting about 1 ½” of water per week during the summer. A rain gauge can help you determine how often you need to use your sprinkler system. A rain sensor can also be attached to your system. It will automatically shut your sprinkler down when it rains. Pruning: Certain trees like birches and maples can be pruned this month. They bleed when pruned during the late winter so July is the best time to get this chore out of the way. Pests: Summer is the season of the slug! Shallow dishes of beer, as well as sharp objects like eggshells, will take care of unwanted slugs in your garden. Meanwhile, still water in your yard will attract mosquitos. If this is a problem, try to drain the water or install a fountain in your pond so that bugs don’t take over your outdoor space. Fertilizer and herbicides: Be cautious about using fertilizers and herbicides during the summer; they can burn your lawn. It may be best to buy your favorite brands and plan your line of attack now but wait to actually apply them to your yard again until late summer or fall. Fall vegetables: Do you love fall veggies? Start planting vegetables like lettuce, radish, carrots, beets, turnips, kale and spinach now and they will be ready to be harvested by autumn.